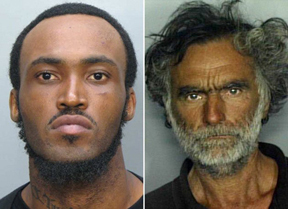 MIAMI (AP) — A homeless man whose face was mostly chewed off in a bizarre, vicious attack faces a bigger threat from infection than from the injuries themselves, according to experts on facial reconstruction. He will require months of treatment to rebuild his features and be permanently disfigured. Though gruesome, such severe facial injuries are generally not life threatening. The most serious risk to Ronald Poppo as he remained hospitalized Wednesday were germs that may have been introduced by the bites of the naked man who attacked him. One of the 65-year-old's eyes was also gouged out. “The human mouth is basically filthy,” said Dr. Seth Thaller, the chief of plastic and reconstructive surgery at the University of Miami’s Miller School of Medicine. It’s not clear why Poppo was attacked Saturday afternoon by 31-year-old Rudy Eugene alongside a busy highway. Police have released few details about the attack, but surveillance video from a nearby building shows Eugene pulling Poppo from the shade, stripping and pummeling him before appearing to hunch over and then lie on top of him. A witness described Eugene ripping at Poppo’s face with his mouth and growling at a Miami police officer who ordered him to get off the homeless man. The officer shot and killed Eugene. Eugene’s younger brother said that he was a sweet person who didn’t drink much or use hard drugs. Thaller, who is not treating Poppo, and other plastic surgeons said the rebuilding of Poppo's face would happen in stages after doctors try to keep his wounds clean, salvage viable tissue and determine a plan for skin grafts. Protecting his remaining eye and maintaining an airway are priorities. To keep the wounds clean, doctors use grafts of the patient’s skin, cadaver skin or synthetic skin to cover the exposed bone or cartilage, said Dr. Blane Shatkin, a plastic surgeon and director of the wound healing center at Memorial Hospital Pembroke in South Florida. The coverage would act like a dressing, protecting the wound as it heals. Poppo’s lifestyle and health before the attack could determine how doctors proceed and whether they eventually consider a facial transplant, plastic surgeons said. Poppo had been homeless for more than 30 years, previously survived a gunshot wound and faced multiple charges of public intoxication, among other arrests. Psychological care is important to the recovery, and patients need to participate in the decision-making process, said Dr. Bohdan Pomahac, a surgeon at Brigham and Women's Hospital in Boston. He performed a facial transplant on a Connecticut woman who was mauled by a friend's pet chimpanzee in 2009. “I think the patient has to be able to cope with the injury and the trauma and needs to figure out what has happened. It often takes them weeks to understand what has happened,” Pomahac said. The will to live is as important for Poppo’s survival as medical technology, said Ara Chekmayan, spokesman for Pomahac's patient, Charla Nash. Nash lost her nose, lips eyelids and hands. The chairman of the Miami-Dade County Homeless Trust, Ron Book, said the last time Poppo sought help from the agency finding someplace to sleep was in 2004. However, on Thursday the Jungle Island zoo on the MacArthur Causeway called for an outreach team to deal with Poppo, who had been living on the roof of the attraction’s parking garage. Poppo was belligerent and aggressive, but he was not arrested, Book said. The nearly 18-minute attack Saturday in the shadow of The Miami Herald headquarters was captured by the building’s security cameras. The newspaper posted the uncensored video online late Tuesday. In the Herald video (http://hrld.us/N9GlGB), a naked Eugene walks west on the sidewalk alongside an off-ramp of the causeway. A bicyclist speeds past Eugene just as he turns to something in the shade, in an area obscured by the tops of palm trees. After a couple minutes, Eugene rolls Poppo’s body into the sun and begins stripping off his pants and pummeling him. Later, the footage shows Eugene pull Poppo farther up the sidewalk. Though the view is partially obstructed by the mass transit rail above,Eugeneappears to hunch over and lie on top of Poppo. The footage shows a bicyclist slowly pedaling past the men about halfway through the attack, followed by a car slowly driving on the shoulder of the ramp. Cars regularly pass by the scene from the beginning of the attack, but their view was likely obstructed by a waist-high concrete barrier. Two more bicyclists cross the scene before a police car drives the wrong way up the ramp nearly 18 minutes into the attack. An officer gets out of the car and appears to do a double-take at the scene before pulling out his gun. He fatally shot Eugene, apparently within a minute of arriving, but the shooting is obscured from view by the tracks. Miami police have not released 911 calls. The Miami-Dade County medical examiner declined to discuss Eugene’s autopsy. It could be weeks before the results of toxicology tests are available. Eugene left his girlfriend in Fort Lauderdale around 5 a.m. Saturday, then stopped at a friend’s in North Miami. He said he was on his way to Urban Beach Week, a series of outdoor concerts and parties on Miami Beach, according to his brother. No one knows what led to him walking naked on the causeway. Eugene had a job detailing cars at a dealership and had been arrested a handful of times on marijuana-related charges, his brother said.